Chester Polcyn sits with one of his young visitors to the Santa House in Gallipolis City Park in December 2015. Chester Polcyn, sitting, is recognized by the Gallia County Commissioners for his time spent serving Gallia as the City Park Santa Claus. From left to right standing are Commissioner Brent Saunders, Chester’s wife Karen Polcyn and Commissioner Harold Montgomery. 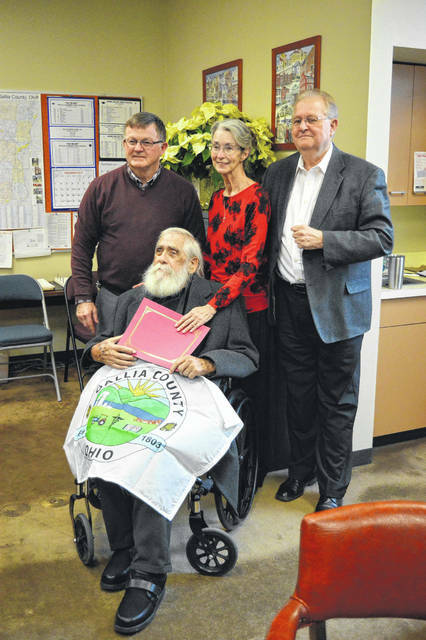 GALLIPOLIS — After serving as the Gallipolis City Park Santa Claus for more than 40 years, Chester Polcyn was recognized by the Gallia County Commissioners for his years of service to Gallia families. Polcyn retired as Santa Claus last year and recently left the hospital after facing medical complications. Polcyn has long credited his wife Karen for her support in his role as Santa. According to information provided to the Gallia Commissioners and shared with the Tribune, Polcyn first started his journey as a seasonal symbol of giving when his first-born was in kindergarten. The PTO needed a Santa to pass out treats and Polcyn agreed. The following year, Polcyn had his own suit and had grown a beard. Polcyn’s first appearance in the Gallipolis Christmas Parade started a years’ long tradition of Santa riding on a firetruck ladder, waving to families as he passed. Polcyn survived heart complications and after being released from the hospital roughly 20 years ago, he persisted to return to City Park and sit as its Santa. He continued to do so until suffering a broken leg in 2016 which prevented him from returning. Gallia Commissioners thanked Polcyn for his years of service and shared personal stories featuring their encounters with Santa. Montgomery remembered a time his granddaughter saw Polcyn outside the Christmas season but recognized him during a meal and wanted to speak with him. 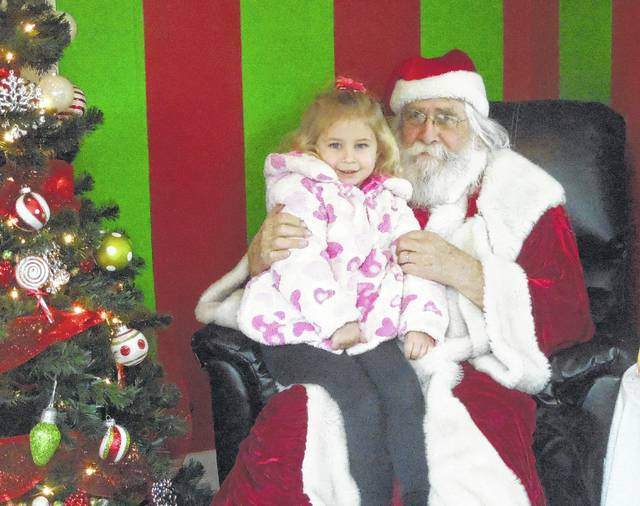 https://www.mydailytribune.com/wp-content/uploads/sites/42/2017/12/web1_DSCN5363-1.jpgChester Polcyn sits with one of his young visitors to the Santa House in Gallipolis City Park in December 2015.
https://www.mydailytribune.com/wp-content/uploads/sites/42/2017/12/web1_DSC_0120-1.jpgChester Polcyn, sitting, is recognized by the Gallia County Commissioners for his time spent serving Gallia as the City Park Santa Claus. From left to right standing are Commissioner Brent Saunders, Chester’s wife Karen Polcyn and Commissioner Harold Montgomery.